On your mark, get set, GO! Take a look at this amazing, and really really long obstacle course. It is not your average inflatable! In fact, it features an entirely covered course that is a great barrier for the Florida heat. On the inside you will race one other person through many different styles of obstacles. 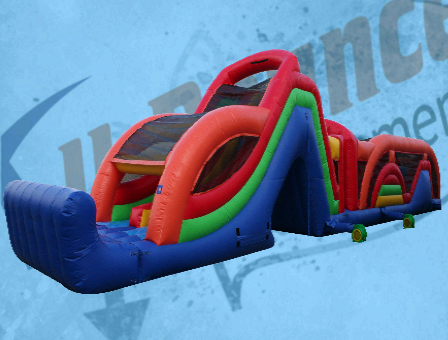 You will end this thrilling interactive game by climbing up and sliding down a 14 foot, 2 lane, wet or dry slide. The entire unit is a whopping 74' long and up to 18' tall in some areas. If you are looking to get some extra attention at your next event, then this is the piece for you. Make sure you have at least a 4' entrance to the set-up area.